From a front-page story in today’s Kansas City Star, it is clear that the strange, self-defeating outbursts we used to see on the field from Royals’ pitcher Yordano Ventura were by-products of a personal life that was at best chaotic and at worst out of control. The writers, sports columnist Vahe Gregorian and Metro reporter Maria Torres, shed much light on elements of Ventura’s life that the public had not been privy to before he died in a one-car crash in the Dominican Republic on Jan. 22. Consider, for example, that the 25-year-old Ventura had been estranged from his mother for nearly a year, since shortly after marrying a woman who was already married at the time she and Ventura married. From The Star’s story, it sounds like the woman he married, Maria del Pilar Sangiovanni, was strictly bad news. The couple argued a lot, and The Star’s story suggests that Sangiovanni’s father might have choreographed two incidents — one in Surprise, Arizona, the other in Kansas City — involving threats to Ventura. After the first incident, Ventura told police he believed Sangiovanni’s father, who has connections to the ruling political party in the Dominican Republic, intended to have him killed. The couple separated in July — six months after the wedding — in the midst of Ventura’s last baseball season, a season marked by Ventura throwing at hitters and getting into confrontations with opposing players. The Star’s story, while it sheds much light on Ventura’s immaturity and bad judgment, leaves unanswered two very big questions. First: How did he end up where he was when he crashed his souped-up Jeep that fateful morning? Second: Was he drunk or on illegal and/or prescription drugs. We may never get satisfactory answers to either question. Regarding what chemical elements might have been in his blood, authorities in the Dominican Republic said last week they have the results of toxicology tests but do not intend to make them public. How should we interpret that? Well, I’d say there’s about a 99 percent chance he was impaired at the time of the crash. I cannot fault The Star for not being able to get the toxicology report. Maybe we will learn about that some day, maybe not. But I do fault The Star for not doing more to get to the bottom of the other big question — how he ended up where he was when he crashed. Constanza, as you can see, is just north of Parque Nacional Valle Nuevo (far left side of the map), off highway 410. Now, maybe Ventura was lost, as The Star’s story suggests, but it appears virtually impossible that the route he was on is “the fastest route” to Constanza. 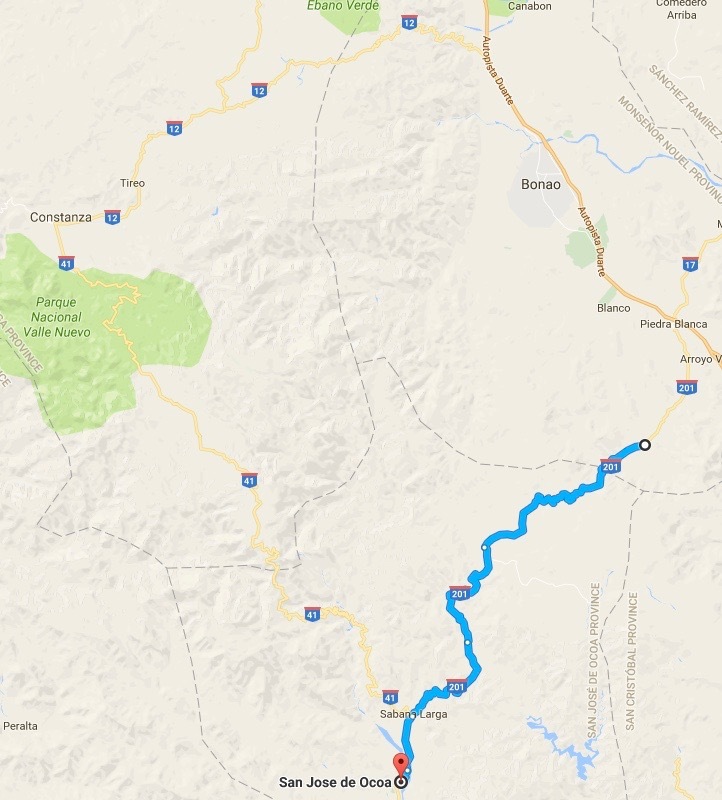 According to the Google map, there are only two major highways heading north out of San Jose do Ocoa: One goes toward Juan Adrian, the other goes toward Constanza. Ventura wasn’t a little off course; he was 45 degrees off. After sending two reporters and two photographers to the Dominican Republic…after weeks of investigation….and after many news and feature stories, The Star, unhappily, still hasn’t unearthed a satisfactory account of what happened that fateful morning in the southern Dominican Republic. I read the story from beginning to end and found parts of it very confusing. Am wondering if The Star reporters drove the route themselves. I hope not, too dangerous. I was surprised to learn Ventura had not talked to his Mother in more than a year. One of the relatives or a friend said something like, Ventura was a child in a Major League uniform–something to that effect. Too much too soon, as they say. So sad. What a waste of life and talent. I just Googled “route from Constanza to San Jose de Ocoa.” The link I got is pasted below. What is shown there is exactly what was stated on the map in the article: the recommended route is through Juan Adrian. As for whether Ventura was drunk or high, I agree it’s almost impossible to imagine he wasn’t one or both. I wish the article had included some comments from his fellow partiers as to what and how much they were consuming that night. I wouldn’t be at all surprised if they were reluctant to provide that information, but in the absence of both that and a toxicology report, we’re just left to speculate. You’re right, Mark…Google Maps shows the roundabout route as the fastest, at two hours and 55 minutes. I slapped that post up without researching it well enough, just going on visual impression. I can’t understand why highway 41 wouldn’t be faster, but we know their roads aren’t anything like U.S. highways. Taking a closer look at the map, up close, it appears the problem with highway 41 is having to traverse the national park, which has peaks of more than 7,000 feet. Still, The Star’s story should have addressed the matter of the route in more detail; it is very misleading to the naked eye…So, I stand by my assertion that The Star has not adequately explained what happened that night. OK, I guess I wrote some fake news.